Do you enjoy reading a fantastic fiction in a leisure afternoon without any matters from work? Yes, of course, who don’t like doing something he or she is really fond of when there is enough time. But nowadays, in this society, most people are living a fast-paced life, they don’t have time to touch every paper of a book, and they always listen to music on their way to work or on their way home from work. All they do is to make everything more convenient and save more time. If you like listening to music, you can save songs in your phone, MP3 or other portable music devices. But what if you like reading fictions or newspapers? Actually, reading fiction is a good way to kill time when you are waiting. But the problem is that you can’t hold a book all the way when you are walking, waiting for the subway or waiting for the elevator. Have you ever thought about saving the fictions you like as audiobooks in your MP3 device? In this way, you can store as many audiobooks as possible and listen to them with your device. Before saving them to your MP3, you may want to know where to find the famous and popular fictions audiobooks on some sites, like the top 10 audiobooks fiction, best dark fantasy audiobooks, best audiobooks ever fiction or best audiobook mystery series. In this article, we will show you the top fiction audiobooks 2018, and the way to save them to your own device. There are many audiobook sites for you to download or listen to the audiobooks online, and here we introduce the biggest and most famous one named Audible. Audible is a trusted Amazon company, so you can count on privacy and security. From the fiction category on Audible, we can find the top fiction audiobooks 2018. The fiction is written by Delia Owens, and it is a story of survival, of what the deep loneliness like when a young girl is abandoned by her mother and later her siblings. At the age of five, Kya understands why they left; it is because of her father, because of his meanness, abuse and his drinking. This fiction will definitely bring some people to tears at a number of places. The author is Kate Morton, a New York Times bestselling author. "The Lake House" has been published in more than 40 countries in nearly 34 languages. In this book, Kate Morton creates a magical world that is also idyllic. Loeanneth is not only a place full of delights, but also a place of retribution, temptation as well as transgression. The book was written by Kevin Kwan, a man born in Singapore. "Crazy Rich Asians" is a funny novel about an Asian family. An heir of Asia’s richest family brings his American-born-Chinese girlfriend back to Singapore for a wedding, and at the same time, a farce also starts. It is also written by Kate Morton. This is a story a about a family mystery, more exactly, it is a multi-generational mystery that reveals itself by haunting bit, featuring three women. It is a horror fiction written by American author Stephen King. The story is mainly about the investigation of a case of a 11-year-old boy’s violated corpse. The novel starts with the tone of a police procedural in the early parts, but then it shifts to a horror novel toward the end. The fiction has a slow transition from horror to supernatural. The fiction was written by Lisa Wingate, a journalist, an inspirational speaker and also a writer. This novel is based on a real social scandal; The Memphis Headquarters Adoption Organization in the United States specifically kidnapped poor children and sells them to rich families. The stories are presented one by one, and finally these surprising stories remind us that this ugliness will never be forgotten. The fiction is co-produced by Stephen King and Owen King. The story is set in the distant future. When a woman goes to sleep, something happens; they are wrapped in a silkworm like a silkworm cocoon. If they are awakened and the gauze of the body is disturbed or violated, these women will become wild and violent. The author is Madeline Miller, an American writer. To readers’ surprise, "The Song of Achilles" is her first novel. The novel incorporates Greek mythology with beautiful words, tells the intricate entanglements between the God and Goddess, the king and the queen, the immortal glory and the love of the mortal, and tells a love story of about three thousand years ago, the taboo love. The American author Laurie Frankel’s novel "This Is How It Always Is" is a story about family. It tells something about revelations, fairy tales and transformations. Most of the time, change is always hard, and parenting is a leap into the unknown with full hearts; children always grow but not always go with the plan. It is Gail Honeyman’s most well-known fiction. It tells a smart, warm and heartening story of an out-of-the-ordinary woman, and in this book, we learn the importance of friendship and human connection. All above is the top 10 audiobooks on Audible, on it, you can find the best fantasy audiobooks 2018, the best love audiobooks or the best horror audiobooks. Here is a problem, you can find whatever kind of audiobooks you like on those sites, but many of them only allow VIP members to download audiobooks, otherwise you can only listen to them online. Then, what’s the best way to record those audiobooks you like without buying VIP membership? 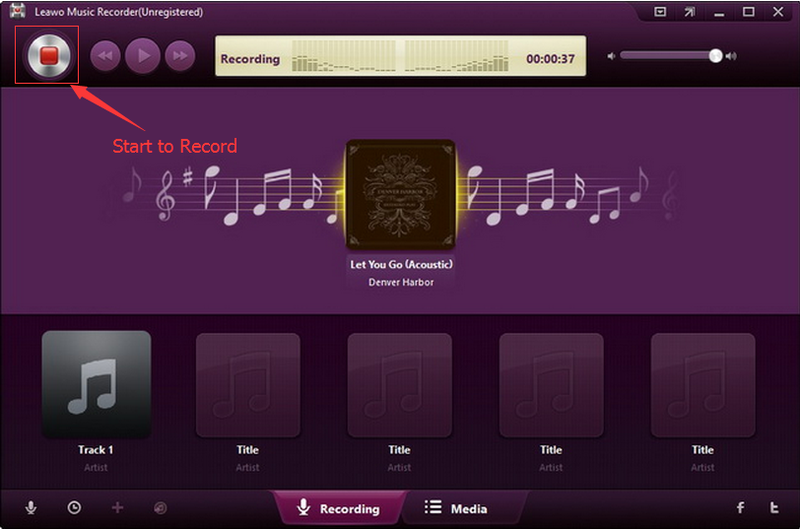 We recommend a music record tool, Leawo Music Recorder . With it, you can save the audiobooks from any sites to MP3 files. You are able to download audiobooks freely. Leawo Music Recorder is a helpful music recording software that enables you to record free audiobooks from built-in input audio, computer audio and online audiobook sites. And all of the recorded audiobooks can be saved as MP3 or WAV format. Download and install Leawo Music Recorder. 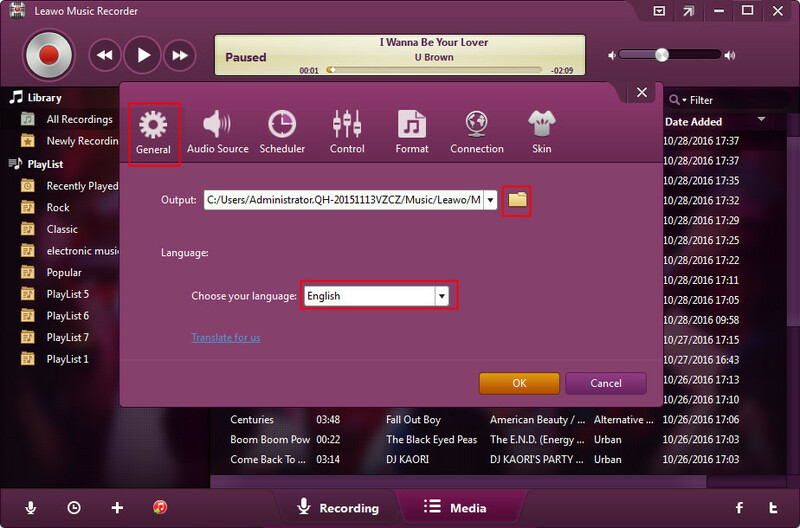 Here are steps to record audiobooks on computer with Leawo Music Recorder. Open the program, and click "Audio Source" icon on the bottom-left corner. To record online audiobooks, you should select "Record Computer Audio" option. 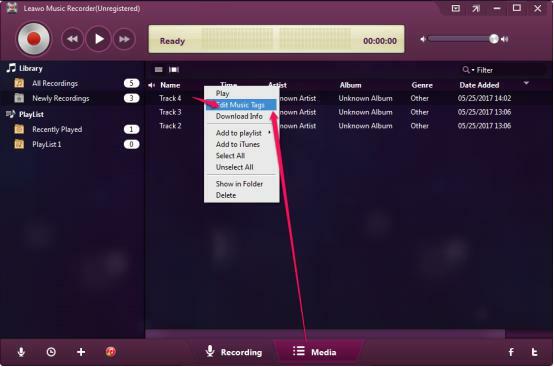 Tap "Format" tab, you can set the format (MP3 or WAV) of the recorded files. 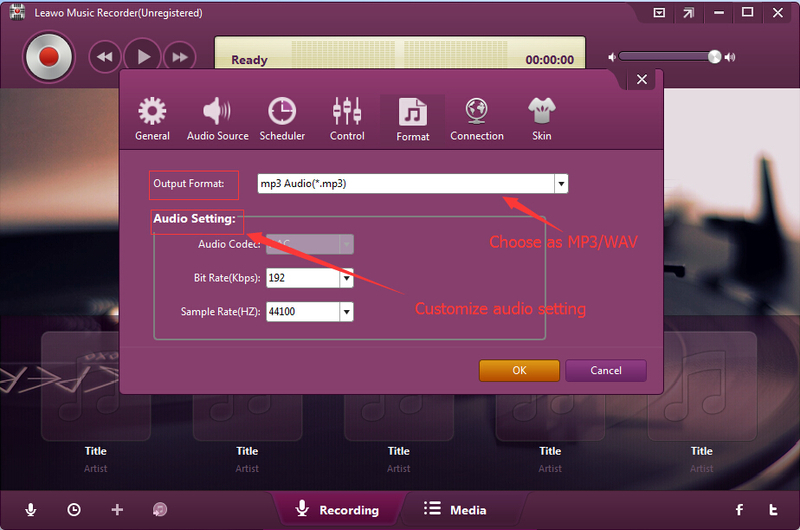 Besides, you can change audio settings by changing bit rate and sample rate. If you want to record voicemail message Android with high sound quality, you can increase bit rate and sample rate. Under the "General" tab you can set the output folder on your computer to save the recorded files. Click "Start" button to make the Music Recorder work. Go to the site and play the audiobook you need to record. 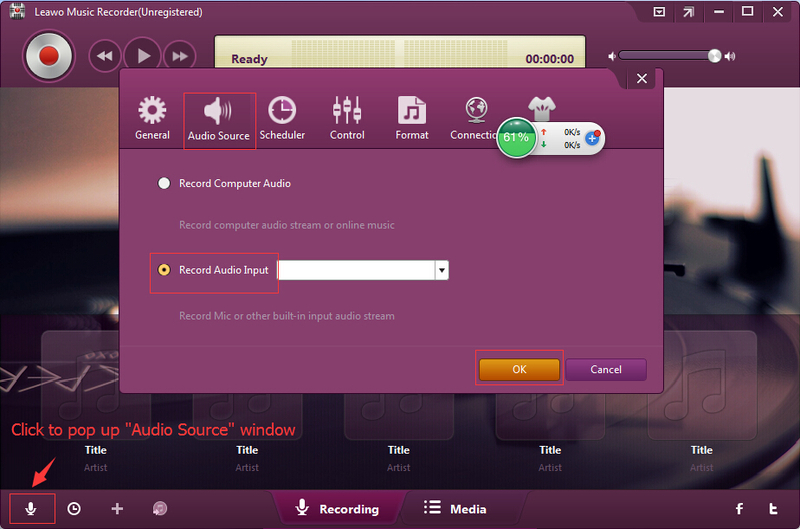 Remember to let the music recording software start recording first and play online source audio later. In the "Media > Library" tab, you can see all the recorded audiobooks. Select a recording and give it a right click, then choose "Edit Music Tags" to manually edit music tags like title, artist or album. How easy it is to record the audiobooks without paying for it! During the recording process, you can do something else and let the program work alone. It is so convenient to have your favorite audiobooks for free. If you’re using a Mac computer, Leawo Music Recorder for Mac could help you record audiobooks on Mac OS 7 and later.